FILE - Filipino student activists set fire mock Chinese ships to protest recent island-building and alleged militarization by China off the disputed Spratlys group of islands in the South China Sea, in Manila, March 3, 2016. 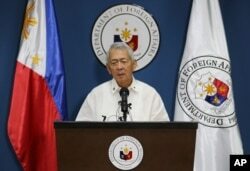 The foreign secretary of the Philippines says his government has rejected an offer by China to discuss their territorial dispute in the South China Sea, because Beijing will not permit last week's ruling by an international court to serve as the basis of the talks. In an interview with Philippine broadcaster ABS-CBN Tuesday, Perfecto Yasay said his Chinese counterpart, Wang Yi, made the offer at last weekend's summit of Asian and European leaders in Mongolia. Yasay says he told Wang the offer "was not consistent with our constitution and our national interest." The Chinese diplomat responded that if Manila continued to support the decision by the Permanent Court of Arbitration, "then we might be headed for a confrontation." The court dismissed Beijing's claim of virtual sovereignty over the nearly 3.5 million-square-kilometer South China Sea in a historic ruling last Tuesday. The decision was a response to a complaint filed by the Philippines in 2013 over China's aggressive actions on the Scarborough Shoal, a reef located about 225 kilometers off the Philippine coast. Chinese Coast Guard vessels have consistently blocked Philippine fishing boats from operating in the Shoal, and did so again just days after the court's decision. Yasay says he asked Wang to put a stop to the blockade. The Hague-based court ruled that China's claims of sovereignty under the so-called "nine-dash line" violates the U.N. Convention on the Law of the Sea (UNCLOS), which established a country's maritime boundaries and economic activities. Beijing refused to participate in the case, saying the court had no jurisdiction to decide the matter -- despite being a signatory to UNCLOS -- and has angrily denounced the verdict. FILE - A Chinese Coast Guard vessel manoeuvres to block a Philippine government supply ship with members of the media aboard at the disputed Second Thomas Shoal, part of the Spratly Islands, in the South China Sea. China has launched a massive land seizure and rebuilding effort throughout the South China Sea in recent years, transforming numerous reefs into artificial islands that can support military installations, ignoring competing claims over the region by Brunei, Malaysia, Vietnam and Taiwan, as well as the Philippines. The Permanent Court of Arbitration ruled that Beijing's rebuilding efforts have "caused severe harm to the coral reef environment." An estimated $5 trillion in global trade passes each year through the South China Sea, which is home to rich fishing grounds and a potentially vast wealth of oil, gas and other natural resources.